Mirpur: Defending champions West Indies charged into the World Twenty20 semi-finals with a spectacular 84-run win over Pakistan in a key Super-10 match in Dhaka on Tuesday. The West Indies recovered from a top-order meltdown to post 166-6 after electing to take first strike, before three wickets each by spin twins Samuel Badree and Sunil Narine skittled Pakistan for 82 in 17.5 overs. The West Indies, who finished second behind unbeaten India in group two, will clash with group one champions Sri Lanka in the first semi-final in Dhaka on Thursday. India, who won all their four league matches, meet South Africa at the same venue on Friday. The final will take place in Dhaka on Sunday. It was the first time Pakistan, finalists in the inaugural World T20 in 2007 and champions in 2009, failed to reach the knock-out rounds in the five editions of the tournament. 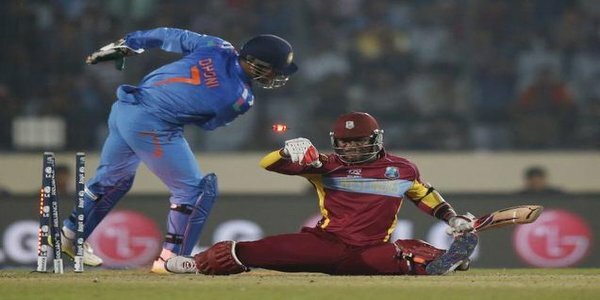 The West Indies slumped to 81-5 before skipper Darren Sammy and Dwayne Bravo led a dramatic rescue act by adding 71 for the sixth wicket off just 32 balls. Bravo smashed four sixes and two fours in a 26-ball 46, while Sammy remained unbeaten on 42 off 20 balls that contained five fours and two sixes. The West Indies plundered 71 runs in the last four overs, taking 21 runs in the 18th bowled by seamer Umar Gul and 24 in the 19th by off-spinner Saeed Ajmal. Pakistan never recovered after Ahmed Shehzad, who scored a century in the previous match against Bangladesh, was leg-before to Krishmar Santokie off the first ball of the innings. Badree removed Kamran Akmal in the second over, Umar Akmal in the fourth and Shoaib Malik in the sixth to leave Pakistan tottering at 13-4. Skipper Mohammad Hafeez (19) and Sohaib Maqsood (18) fell in successive overs to make it 42-6, before Narine removed Shahid Afridi and Sohail Tanvir in four balls to hasten the end. Earlier, the West Indies lost both openers by the fourth over, with Chris Gayle stumped off Hafeez for five and Dwayne Smith caught behind off Tanvir for eight. Lendl Simmons and Marlon Samuel add 39 for the third wicket when both batsmen fell in the 11th over to reduce the West Indies to 67 for four. Lendl was run out for a 29-ball 31 while attempting a cheeky single, while Samuels was bowled by Shahid Afridi for 20 after striking a six off the previous delivery. It soon became 81-5 as Denesh Ramdin holed out in the deep off left-arm spinner Zulfiqur Babar, but Sammy and Bravo stepped in to play what turned out to be match-winning knocks.